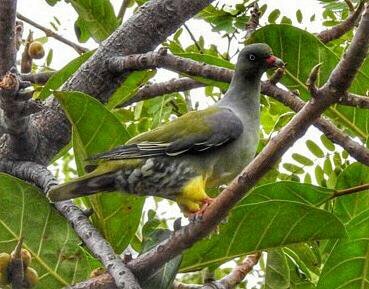 The African Green Pigeon, TRERON CALVUS, is an attractive bird with green, yellow, mauve and red markings. It has an olive-green back, grey-green head, yellow leggings, mauve eyes and tricoloured bill. It is fructivorous and frequents the canopies of evergreen fig trees where it is easily camouflaged. Like other doves, its nest is a flimsy arrangement of twigs usually in a fork of a tree. We have been privileged to have Green Pigeons at Tremisana most of the summer. As there are 2 sets of monthly reports, I have had to edit and reduce – sorry guys ! December held nothing but great new experiences with amazing sightings of the famous Big Five, Wild Dogs and other plains game. We have been fortunate to receive sufficient rain that has filled all the watering holes and left the Olifants River flowing well. The Bushveld has magically turned from a dull brown colour to a beautiful lush green. From spotting the beautiful and rare Wild Dogs to a spectacular 3 out of the 5 sightings within the first 30 minutes of the drive this month has truly given us many experiences to look back on in awe. On the drive to where we conduct the bushwalk we have encountered rhino, elephant and lion. We have had multiple encounters with the hippopotamus in the river. We have managed to encounter Elephant and Rhino as the afternoon cools down. Our lovely Shannon close to a lovely lion ! My all-time favourite drives have proved to be the best drives I have had this month. We managed to locate a beautiful male leopard in a river bed relaxing in the grass in the shade. It was an absolute stunning sighting and we had a great time viewing the relaxed animal. I have also had numerous Rhino sightings as well as amazing Lion sightings. 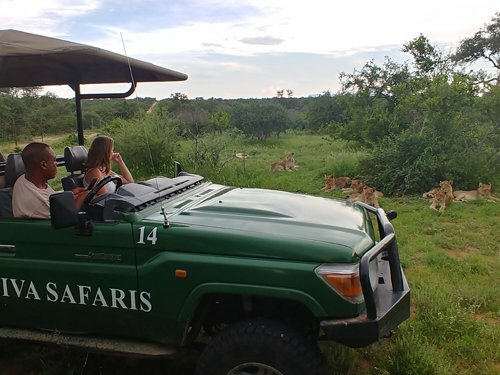 We welcome our guests on their first wildlife experience by taking them out on a sunset drive as an introduction to the bushveld as we make our way towards Marula Boma for dinner under the stars and the famous Marula tree. It is a drive that guests enjoy and we have managed to spot elephant, occasionally rhino, buffalo at the dinner area and lions roaming through their territory. It has been an eventful month here on Balule Nature Reserve Greater Kruger area. With sufficient amounts of rain all our waterholes have filled up and the Olifants River is streaming down strongly. We have experienced many sightings that have left us in absolute awe. I personally have experienced my best sightings this month in my last two years of guiding with Viva Safaris. From Lions, Rhinos, Elephants, Giraffe to the smaller things such as Black-backed Jackals, various bird species and our other general game, the morning drives have been amazing and such a great way to wake up and start the new day ! The denseness of the veld means we need to be more cautious. We focus on all the smaller things. 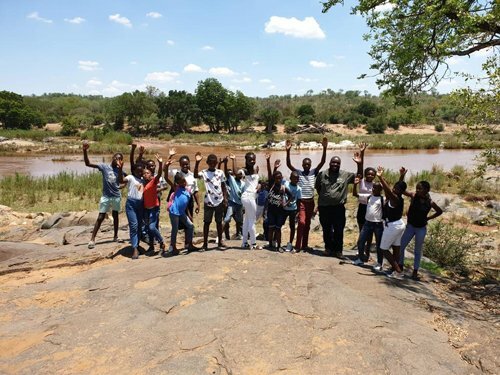 With it being summer, we see multiple migratory birds, different species of insects and of course down at the Olifants River we come across the Hippos and sometimes Crocodiles. The heat is intense but the opportunity arises unannounced where we find Rhino and even Lions lazing out under the shade provided by the vegetation. We managed to find Rhino, Elephant, Lion, Wild Dogs, Giraffe and Zebra. Blessed with breathtaking sunsets and sightings worth remembering for a lifetime, it is an introductory drive and what an introduction indeed! We had Lions – not 1 not 2 but 19 of them! Rhino and Elephant. My most memorable drive was with a family of 7 and one couple; we took our time back from dinner at Marula Boma to the lodge and came across a single Male lion lying in the road. We stopped and enjoyed the sighting to be given the opportunity of a lifetime -the male stood up and walked right past our vehicle on the side leaving the guests with a true feeling of staring into the eyes of a Beast. We had a fantastic encounter and left them with such great memories. December has been busy being the festive season and many guests coming our way. We also had a group of college students out doing some work with the local community. Sightings have been very good : the rains have prompted the impalas to start dropping their babies. My two personal favourite sightings were seeing a herd of around 150 elephants on the s100 in Kruger. They were relaxing next to the vehicles when all of a sudden two young bulls showed up and disrupted them. The elephants started running and trumpeting all around us ! The second was with the college group. We had struggled all day to find lions and then when we did, there was a herd of buffalos heading towards them ! We watched as the battle between lions and buffalo erupted and the lions tried to grab an individual from the herd but were not successful. This month there have been very good black rhino sightings on Motlala. These include some sightings of the new baby that is now only a month old. I had his mother charge me just the other day while trying to see what gender the calf was, as our Warden had requested. 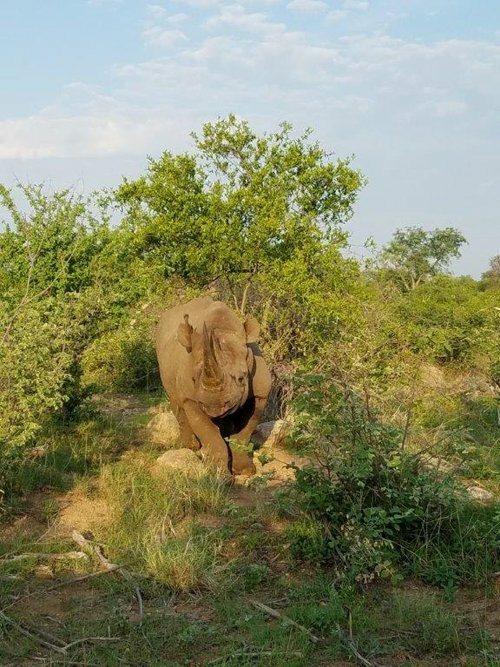 Motherly instincts are strong with her charging me then running with the calf to the thick bush to protect it just like black rhino should. Turns out we have another new bull. 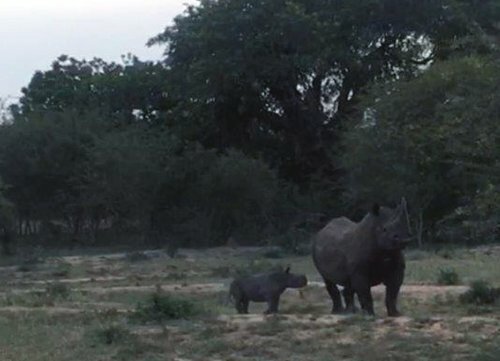 This is great news for us with the last baby that was born last year February showing the rhinos are doing well on this property. 7th : At Gudzane dam in Kruger we found a pride of Lion with one male and seven female lying down very close to the road. On the S100 we found a big herd of elephant crossing the road. 18th : At Barnard on Balule at Ngwenya dam we found a big herd of elephants swimming. We spent 20 minutes with them – my guests were very happy seeing the young elephants playing with mum. At Rome 1, we saw 3 black rhino very close to the vehicle. At the entrance of Marula Boma we found a male leopard hunting. We followed him while he was tracking impalas – they saw him and they warned one another and they ran off into the bush. 20th : We found one lioness with three cubs feeding on an Impala at Barnard airstrip. 27th : At the entrance of Campfire we found four big elephants. Then a male lion next to the road and to top it off we found (Zulu) the black rhino by the dam which means we got three out of the big five in one 5 km drive ! We have had good sightings: elephants, lions, black rhinos have been plentiful all month. On a sleep-out on the platform at Marula Boma, we had hyenas and honey badgers with us for 2 hours. We had a good sighting of a young female leopard near Marula Boma. Sunset drives have been productive – loads of elephants and great Black Rhino sightings. Hippo have taken residence at Campfire dam. Lion sightings have also been good this month and we are seeing a male leopard near Marula Boma quite frequently. He is not shy at all. It was a warm day in Kruger – between 29 to 35 degrees. Lots of elephants on the H7. On the S36 on the way to Mudzandzeni picnic spot we saw a male leopard crossing the road – great photo opportunity. At Shimangwaneni dam we saw two male lion next to the water. We continued our drive to Satara on the Sweni road and saw buffalos at Welverdiend waterhole. After lunch on the S100 at Xibotwana waterhole we saw a male lion and a lioness mating. Buffalo herd nearby. On the way out, we saw White Rhino – so we saw Big Five in one day. Between the boom gate and reception we saw general game including giraffes, zebras and kudus. At Kingfisherspruit we saw an elephant herd of 55 animals crossing the road. At Nwamatsantsa we saw three lionesses. On the s36 to Mudzandzeni picnic spot at Rockvale waterhole we saw five buffalos drinking. 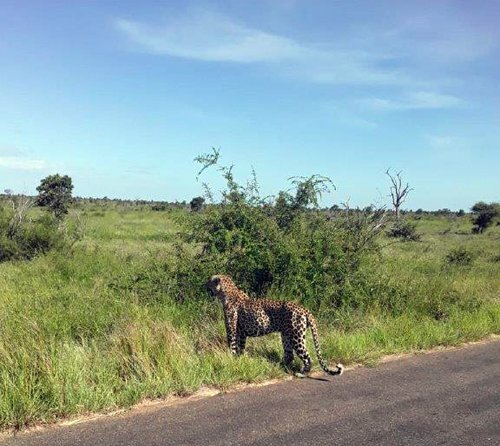 We took the Sweni road and at the Sweni Bridge we saw a leopard crossing the road – great sighting. White Rhinos on our return journey as well as Wild Dogs running on the road – Big Five in one day again ! It is a lovely month with the rain – the bush is looking good and the animals are enjoying it – I can see it in their eyes. It feels so good to see them in a very good condition. I went out on one sunset drive and we saw lots of impala, giraffes and a breeding herd of elephants. My clients were so excited to see them so close. Then when we reached Marula Boma, we saw a hyena busy looking around the Boma – that’s when my guest were very scared. 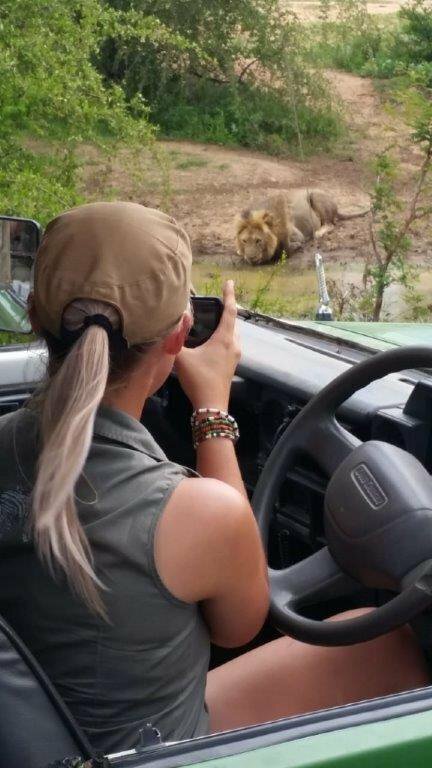 Then we heard lions roaring and everyone wanted to jump back on the Cruiser – Hakuna Matata ! Viva Lion King Viva ! We had such a wonderful dinner with the guests telling me they would NEVER forget this night !! I went out for a Bush walk with Shannon – we saw one bull elephant that was very close. We had a nice view. Then we left him in peace. When we approached the Olifants River we saw hippos and crocodiles. As it is hotter, the crocs are being seen more frequently. At Marula Boma we see honey badger and hyena every time. One night when we reached Tremisana Lodge we saw a pride of lions just at the back of the lodge – it was so amazing because we had been driving around everywhere with no lion sightings and then we saw them at our back yard lodge ! Hakuna Matata. Some people want to see everything the first day they arrive – it doesn’t work like that. The Bush is green and beautiful and the animals are enjoying nature. Because there’s food anywhere it is hard to view them but nature will always surprise you. This month we have had improved sightings of elephants, Black Rhino and lions. Leopard and buffalo only occasionally. The rainy season is officially here with the first big rains already fallen…As a Nature Guide you can feel relief in animal behaviour now that they know they have nutrients again. Baby Impalas around every corner and happier predators as they also have a lot of food. One day we had a big group of 25 University students. Between the 2 Boom gates at Orpen, we saw some big bull Elephants. Going on 3 buffalo bulls lying in the grass. We had an excellent sighting of Blue Wildebeest, Giraffes, Zebra, Kudu bulls with big horns and Impala rams. On the S36 to Mzanzeni we found Spotted Hyenas. On the S125, we found some old Elephant Bulls that just mud-wallowed and about to cross the road – we made a big enough channel between our safari vehicles to let them pass – really close – one student put on her running shoes – ha ha. 3 kilometres on I saw my colleagues all bunched up. Guess what? A female Leopard! At our lunch stop we heard of lions at Sonop windmill. When we got there, we saw 2 big male lion looking at a herd of buffalo. We knew were in for a HUGE treat – 15min later one of the Buffalo bulls ran towards the lions and then retreated back to the herd. The male lion decided to have a go at it and we saw him jumping on the back of the buffalo. The lion was unable to pull the buffalo down. Next the buffalo reinforcements acted – talk about precise timing wow “speechless moments” which was absolutely amazing. They charged the lion and he fell off the buffalo. Next the rest of the Pride flew up out the grass just a bit further back – cubs, sub-males and females about 15 lions in total ! Two MASSIVE Buffalo bulls charged the two big male lions. The Lions just ran away and went to lie underneath a bush. EXCELLENT WILDLIFE EXPERIENCE in every way you could imagine !!!! The students were absolutely gobsmacked – new word I learnt. And on the way out Rhino to complete our Big Five. What a day !!!!!!! Africa was Alive. 2nd : Hot day, sightings good, lions s41 near Nwanetsi , elephants s100 Xibotwana, buffaloes s100. 6th : Rockvale on s36 lions, elephants Mudzandzeni, Sweni white rhinos. 14th : Lioness Girivana dam, elephants s100, buffaloes s100. 22nd : Very hot 40 C, s100 lions, rhino s100, Sonop waterhole 6 lions, elephants h7. 27th : Lions h6 road, elephants and buffaloes s100, cheetah at Xibotwana, 4 rhinos near Orpen. 30th : Elephants h7, lion Girivana windmill, buffaloes s41, two cheetahs Xibotwana. 3rd : Lions s36,elephants Ximangwanini dam, leopard s90, buffaloes Sweni road, cheetahs s100. 8th: Lions H6, elephants s100, hyenas crossing the road, buffaloes Rockvale waterhole, ostriches h7 road and white rhinos h7. 13th : Lions with a giraffe kill on h1-3 before Sweni, buffaloes and elephants Sweni waterhole, rhinos s36. 19th : Lions at Xibotwana, elephants at Sweni waterhole, s90 lions, buffaloes at Timbavati, cheetahs s40, 2 male lions at Girivana dam. 26th : Lions onh7, buffaloes s36, elephants Mudzandzeni, hyenas eating kudu Phelwane. Lots of birds eg carmine bee-eaters, European rollers, coucals, kori bustard, eagles and vultures. 27th: Sweni elephants and buffaloes, mating loins Kingfisher junction, three white rhinos. 28th : Elephants s36, lions s90, cheetah crossing from s100 to h7 road, rhinos h7. 5 January : Elephants ,buffalo and leopard at Open – great start ! Lions later on. 10 January : Elephants before Orpen , lions Girivana , buffalo s100 and leopard Xibotwana. 20 January : Lions s100 ,elephant and cheetahs s100, buffalo Rockvale and hyenas. 26 January : Leopard h1-3 before Nkaya pan, Wild Dogs near Kingfisherspruit, cheetahs Xibotwana buffalo s100 and white rhinos near Orpen. KATEKANI has had a lot of newborn impala, bushbuck and nyala keep our guests happy. 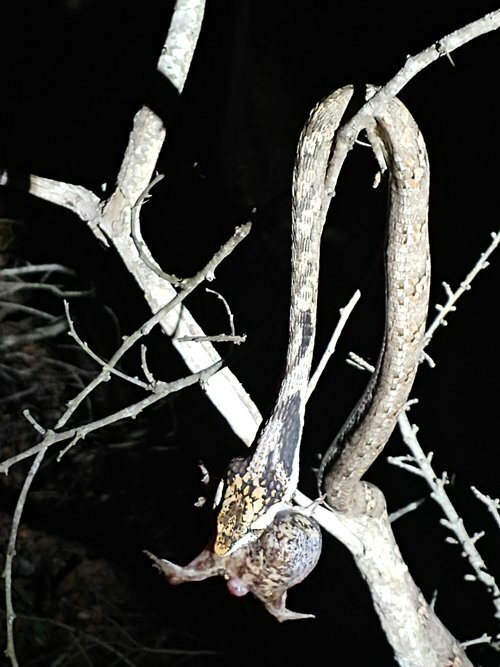 On one occasion I saw a very long vine snake catch and devour a bushveld rain frog. TREMISANA is looking good after great rains. We are building a new flatlet for use by the Manager. From time to time, the elephants return. 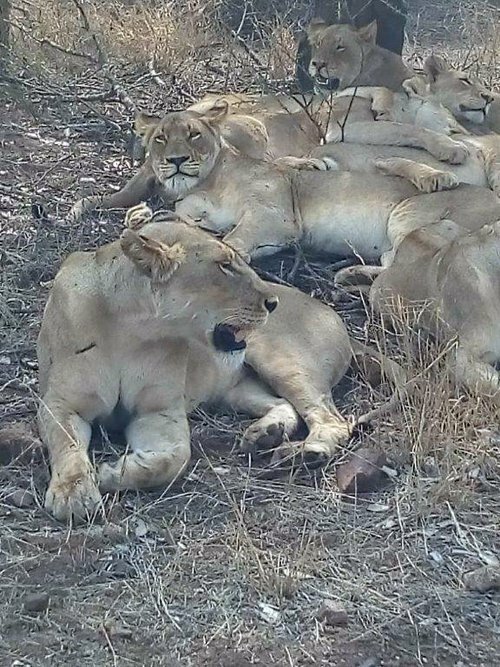 On the first day of my January visit, there were 13 lions on the property – what a welcome ! The month was full of exciting sightings. The mornings were always pleasant with the guests eagerly preparing to go on their different activities of the day. The warthogs having a mud bath next to the waterhole at Tremisana Game lodge was a regular event in the mornings. The Vervet Monkeys had a bit of challenge as there were baboons that frequent the lodge as well. One day the guests who were having dinner disappear from their table to check why the monkeys were making noise hoping to see a predator – to their shock the baboons were chasing the monkeys in front of the Lapa (Breakfast place). They cheered on the monkeys while laughing saying the wildlife never disappoints. Birds lover also enjoyed the vultures, Yellow billed Hornbill and Marabou Stock. We had different types of animals that went to drink water at the water hole which includes a pride of lions one evening that went to lie down behind the fence near the lodge. The night times were filled with beautiful melodies of the hyenas which were whooping and laughing outside the lodge. This seems to be the best month as we had a bit of rain which has help with the plants getting greener and the strong scents of wet soil. MARCS Treehouse Lodge gardens are looking a lot better under the attentive eye of new hostess, Collette. 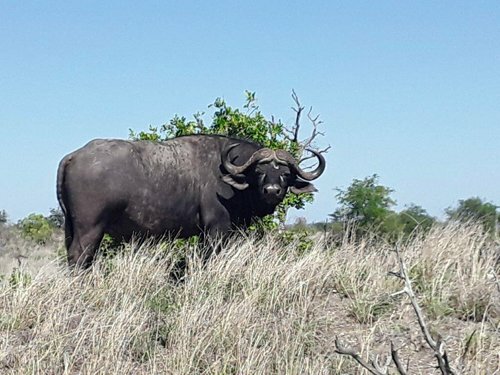 There have been good sightings of buffalo and Black Rhino at the camp. We have fixed the zips of the tents and have redone the thatch roof of treehouse 6. We hosted our annual Christmas party for our Orphans. They seemed happy and appeared pleased with our efforts. There is always the danger of inculcating a sense of entitlement in the recipients and one needs to be circumspectly cautious with charitable activities. We are pleased to welcome back Riana and Janneman. I will be mentoring Riana in assuming a management position at Tremisana. Janneman will be joining the guiding team. 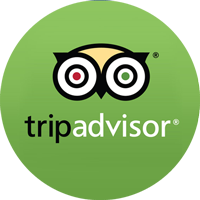 I include some good reviews posted on Tripadvisor in the last 2 months. We came for six days originally, but when it came time to go we were not ready to leave. We extended our stay another 6 days. It was not only the friendly staff and tours, but the beautiful peaceful tree houses where you can sit on your back deck and watch the wildlife at the creek below. The trips were fantastic and educational, also our stay has been fabulous. All of the guides for the tours are very knowledgeable and answered our thousands of questions. scimmie, facoceri e “Bush Mc Donald”. Le cuoche sono straordinarie, a pranzo vengono serviti 2 piatti mentre a cena si possono gustare ricchi piatti tipici, dall’antipasto al dolce. Consiglio a tutti il bush walk così da poter gustare la colazione in una meravigliosa cornice che include un’alba spettacolare. Our stay in Katekani was simply put, amazing. The pictures and reviews do not do justice to how nice this tented lodge really was. Arriving at Katekani, we were greeted by Margaret who took us to our tent and explained how everything worked. The “tents” are actually raised up onto a four foot platform and didn’t really feel like a tent to me. I had searched the reviews online prior to coming and it didn’t prepare me for how immaculate and beautiful the grounds were, especially at night with the lighted paths. As for the room and splash pool, they were fabulous. Each day our room was turned down with new sheets/comforter every day!! I could go on and on about the grounds and room, but the real stars here at Katekani…is the staff. The chef Tiger made every meal a real treat for the senses – great portions – home-made rolls – vegetable lasagna that was really the best I’ve ever eaten – homemade cheesecake, fresh cut fruit every morning, I could go on and on!!! Margaret and the rest of the kitchen staff made every meal a special experience – different table settings with use of local flowers, rocks, fauna – we felt very special!! Almost forgot to mention — power in Africa can be tricky after big storms, of which we certainly had!! The staff still provided everything for a complete dinner/breakfast – hot coffee, eggs, etc — amazing!!! Just returned home from an amazing experience with Viva Safaris. Everything was exactly as promised – pick up from hotel and guide explained everything we would experience along the way – lunch stop in Dullstroom at the Mayfair restaurant was pre-arranged and they were ready for us, which was nice. Evening BBQ was a little scary at first, but became a nice bonding experience with the fellow travelers we would come to see throughout the week. After our night in Tremisana Lodge (which I will review separately), we were driven over to our next lodge; Katekani (WOW – also will review separately) and followed through on our itinerary of game drives for each day. I loved that every night at dinner, the staff would explain exactly how the next morning would go, pick up times, breakfast times, etc. This was helpful, as not every guest is doing the same itinerary. Our game drivers felt like family, specifically Victor and Nico. We were very lucky and saw the Big Five with Victor and an awesome Lion and Lioness crossing in front of our vehicle with Nico. I really appreciated their ability to handle a safari car-load of people from all over the world – language barriers were never a factor and they always made sure we were comfortable!! 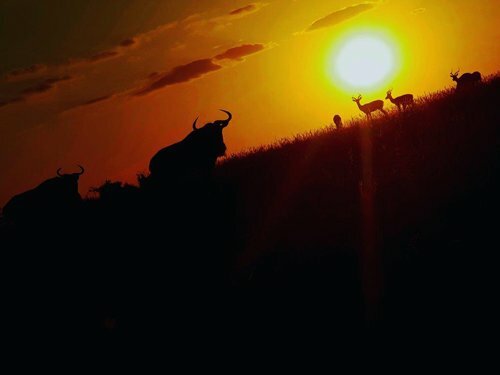 I would highly recommend Viva to anyone who was looking for a safari adventure in Kruger!! !